There’s a science and art to creating the perfect look and feel of a space that is also functional when incorporating technology into a smart home design. One piece of smart technology we’re particularly excited about this year is the hidden TV. We encourage interior designers throughout Virginia Beach to consider the possibilities of utilizing hidden televisions in your upcoming projects. With interior design, subtlety can be a powerful tool. Fortunately, hidden technology like the Séura TV Mirror makes a subtle design easy to implement. It’s exactly what it sounds like: a mirror when the TV is off, and a high-quality television when it’s time for the viewer’s favorite show. Customize the frame and shape to match the look of the space in your smart home design. This innovative product can be used in any setting where a mirror would be appropriate or necessary — like a living room, bedroom, or even a closet as a vanity mirror. The display is available in sizes from 10 inches to a 65-inch 4K UHD TV. 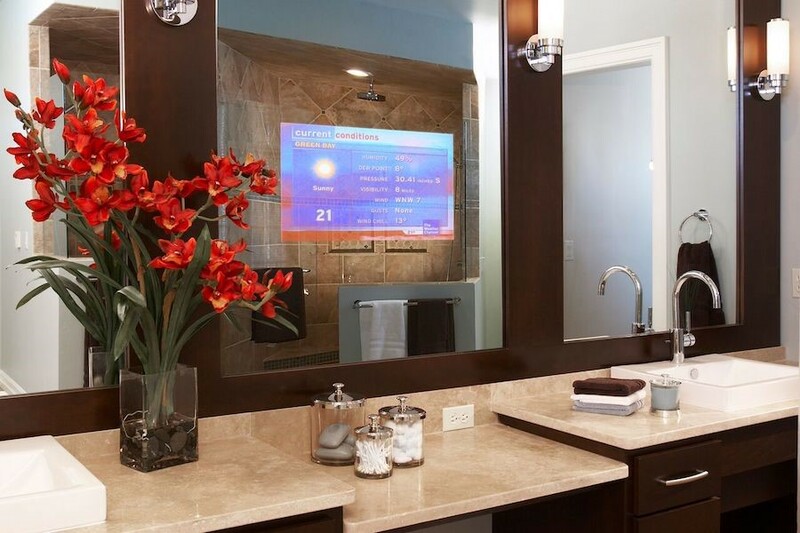 The benefit is twofold: the TV is strategically placed in an appropriate setting for the homeowner to watch, and the mirror is both decorative and functional — providing both a luxurious aesthetic and piece of technology for the room. The LG Signature OLED Wallpaper TV is so thin that it lays virtually flat against the wall it attaches to directly. This allows for a truly minimalist look. Whether off or on, the display blends into the wall, making it a subtle addition to any space. No need to sacrifice quality or technology for aesthetics in your smart home design! The homeowner can enjoy high dynamic range (HDR) 4K display that also supports Dolby Vision, a technology that optimizes the display quality. Despite what some may think, artwork and TVs are not mutually exclusive. If you’d like to hang wall décor or a piece of art, but also need to incorporate a television in the room, you may be faced with two issues: 1) What if they are competing for space? And 2) What if they clash aesthetically? Moving panels provide a clean solution. Simply place the artwork on the panel. When the TV is not in use, the room benefits from the beautifully displayed décor, and with the press of a button, the panel slides up and reveals the screen. Incorporating hidden technology into your smart home design allows for you, the designer, to maintain the space’s aesthetic without losing out on smart technology that will simplify your client’s life. Want to learn more about smart home solutions for interior designers? Reach out to us here or give us a call at (757) 493-5000.